The minibooks in this series offer thoughts and meditations on love and friendship to enjoy and share with a special friend or relation. This volume deals with fathers. Part of the "Heartfelts" series, this tiny giftbook contains thoughts and reflections on love and friendship to share with a special friend or relative. 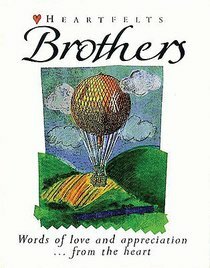 This title includes a range of quotes and sayings that capture what it means to be a brother.